A fresh vegetarian BLT sandwich with spicy chutney and served on tiger bread. I posted Meat Free Mondays this morning, so that's dinner covered. Now it's time to think about lunch for tomorrow and the rest of the week. Leerdammer challenged me to come up with some tasty sandwich recipes to make lunchtime fun, I couldn't resist and said yes. It can be so easy to get into a lunch time rut. LEERDAMMER cheese combines the mild flavour of Gouda with the large holes of Emmental. It's named after the town near the dairy called Leerdam. It comes in sandwich size slices, has a mild nutty flavour and it suitable for vegetarians. A standard BLT is an popular American sandwich, stacked high with bacon, lettuce and tomato, but I wanted to bring you a vegetarian version and one I love. Today I bring you the Leerdammer BLT, but instead of bacon it's beet. So, so good! For the rest of the week I'll be sharing more delicious sandwich ideas, so do tune in. A fresh sandwich of Leerdammer, beet, lettuce and tomato, with spicy chutney on tiger bread. 1. Spread the bottom slice of bread with chutney and the top with mayonnaise.2. Slice the lettuce and pop on top of the chutney, then add the slices of cheese. 3. Slice the tomatoes and add them to the sandwich.4. Add the beet and a good grind of black pepper, then top with the second slice of bread. Cut in half and tuck in.5. Enjoy! 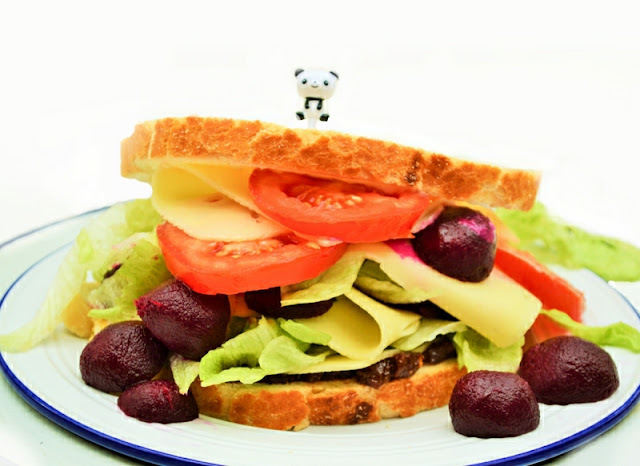 The sandwich looks delicious, I should try to add beetroot in the sandwich instead of making it as a salad. It's a very good idea. It's really good in sandwiches, both fresh and pickled. It's a great quality cheese slice Jeanne. Quite mild, but a definite nutty flavour. Whipped this up for my lunch - AMAZING! YAY! Hope you enjoyed it Emmy. 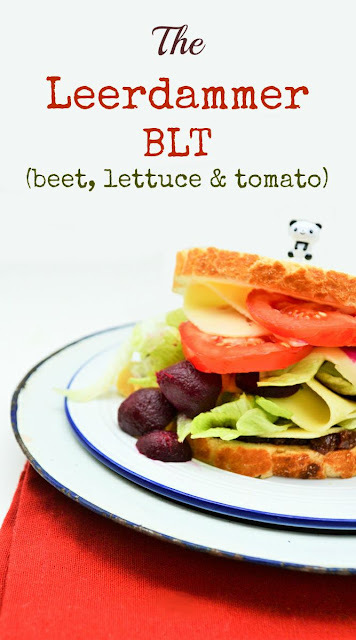 Love this Jac - what an awesome sandwich and love the Beetroot BLT idea! Having fun with my Leerdammer sandwiches this week too! Never had a beetroot this way in a sandwich but we Polish love beetroots so why not? It really looks scrumptious! You should try it Sylvia, it's really good. Looks right up my street. Love the cream Swiss cheese and now I'm craving a sandwich at 10pm!